Yesterday, Sunday, we headed out to a beach bar on the outer harbour to hang with friends and eat brunch, play beach volley/football and soak up the sunshine - 25 degrees. This has nothing at all to do with bikes as we took the harbour taxi across to the beach bar. Yes, I have a point. I think. On the way home, as we walked to the metro station from the harbour, Wifealiciousness and I discussed how many people merely wear flip flops in the summer while riding their bikes. Sure enough, as we looked around, they were everywhere. 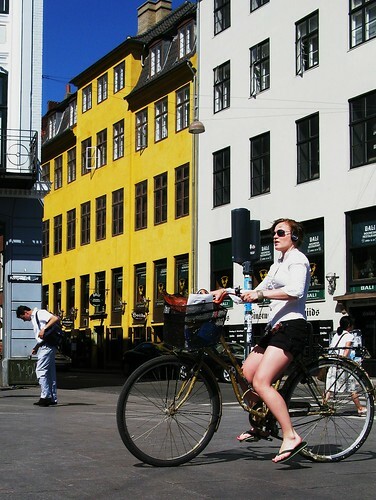 Fair enough, it was a hot Sunday afternoon and most of the city was heading home from the many beaches around Copenhagen - as you can see in these photos - but flip flops are the casual and comfortable end of the cycling footwear scale in the Copenhagen Summer. 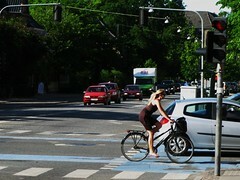 Today, over at Copenhagenize.com, we have a post about how IKEA Denmark are launching a free bike & trailer scheme, with Velorbis bikes, so that Danes can get their IKEA stuff home from the so-called 'Big Box Districts' outside of the city. 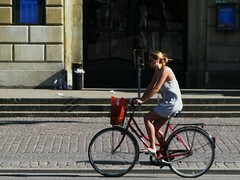 IKEA found out that roughly 20% of their customers in Denmark make the trip to their stores by bike. The new scheme is set to increase that number. 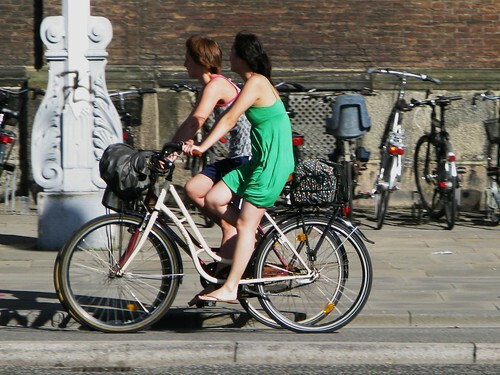 See a fantastic video with John Pucher about how to increase the number of bikes in North American cities, based on experiences here in Europe. Read about the Dreams on Wheels exhibition about Danish bike culture that just opened in Australia and that will be travelling the world over the next year - complete with photos from this blog. See how Copenhageners both get their goods to a flea market and how they get stuff they buy home. Hint: Bikes are involved. hey raquel, gladiator sandals are hot this summer here, too. i have a post about them coming up. but as mindcaster says, they are universal and never go out of style. I tried riding in flip flops...once. The resulting trip to the emergency room, after stubbing my toe on the ground cured me of that. The next best think I have found, so far are Crocs I also wear the Sperry Topsiders leather boat shoes for casual wear. But to each their own, and I would hope they are not as prone to minor mishaps, as I am. I've been rocking the flip flops all summer, no injuries yet. Haven't seen any gladiators stateside though. I think I did see one pair in SF actually. Love the Pucher video. We were lucky enough to have him speak here recently. What an inspiring guy. He makes you feel like North America could be like North Europe.